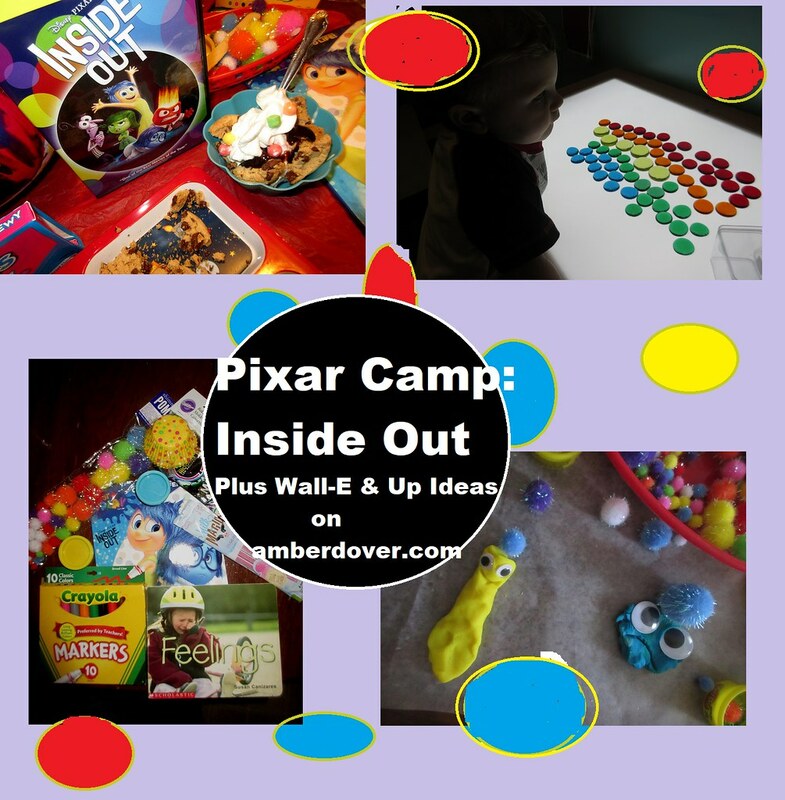 In this post: My 9th and final Pixar Camp post! A colorful time with the characters of Inside Out! Also, ideas for Wall-E and Up. Hello, Dear Ones! Wow, I’m finally finished with our Summer posts. I am super excited to share our school plans. I still have to catch up on 5th and 6th-grade posts as we move on to 7th. So if things seem a bit scattered around here…that’s why. I do have a plan though. We’ve had a fun Fall already with the Biblical feasts and I’ve got lots of great Sukkot ideas to share as well. The kids have been sick for two weeks so I’m just now taking a breather to blog. Whew…I need a nap! Ha! Well, for now…Our last week of Pixar Camp. It was a rainbow of emotions! Inside Out- One of many Pixar films that made me cry. Sadness must’ve pushed all the buttons in my head. If you haven’t seen the movie, I encourage you to watch it and then come back to this post or confusion may ensue. This delightful tale is about the people inside our heads. What, you don’t have people in your head? Surprise! You actually do! All of us have Sadness, Anger, Joy, Fear, and Disgust living in our heads…controlling how we act! Just watch Inside Out and you will get a glimpse into this secret world. There are other emotions of course, but we only meet these five. Okay, so we probably don’t have little people in our heads….but it is hilarious to imagine what it would be like. One neat fact about this movie: They consulted psychologists to help them accurately portray how our brains work. Don’t get lost in “abstract thought” now ;). Riley, the main character, has memories that look like colorful marbles. The emotions collect these memory spheres in headquarters and send them through a tube to the rest of the mind. The whole cast is quite colorful. Joy is blue and yellow. Anger is appropriately red. Sadness is blue. So I decided to use a rainbow theme in our food. Colorful Fruit Loops and fruit made up our breakfast. Chicken Fried Rice with Yum Yum sauce made a tasty and colorful lunch! Rainbows and Trolls Supper- We continued with colorful food. We had a colorful salad and muffins. We also watched “Trolls” and had Troll Mac n’ Cheese (at Leeland’s request). Trolls is another emotion filled movie. They help people feel happy. Emotions Activities- I broke out the books on emotions and colorful craft supplies and treats. Music- As I read the emotion book I stopped on each emotion and found an appropriate song on Youtube to accompany it. “Happy” is obviously an easy one. “One” (is the loneliest number) is a good song for sadness. We also watched cartoons about emotions. Finding Emotions in Magazines- Michael helped out by cutting out pictures in magazines. Then we placed them into three categories: sad, mad, and happy. Then I used them as a teaching tool for Leeland. Coloring and Playdough Fun- Leeland used playdough, wiggly eyes, and colorful pom poms to make his own emotion creations. A rainbow of emotions at our colorful museum- Our museum is super colorful and has a fun play area. Puppet Play- We used puppets to convey emotions. I really got into this roleplay…until I remembered other parents could hear me. Ha! The ANGRY kitty and the HAPPY unicorn. We worked on sorting the colors and we talked about how certain colors made us feel sad or happy. Finding Emotion in Museum Paintings- Michael was able to get on board with this part of our museum excursion. We walked through the grown-up section and looked for emotions in the artwork. I only took a couple of pictures. There was a red room representing war and that made for an interesting discussion. Frustration…that Mom is taking another picture! So we watched the actual movie and enjoyed colorful ice cream with chocolate chip cookie crumbles, whip cream, and Sweet Tarts (to represent memories). Michael’s Emotions and His Islands of Personality- I love Michael’s portrayal of his thought life. You can see all of his emotions are wearing baseball caps! I love the ideas of Islands of Personality. I think it’d be fun to have everyone draw what their’s would look like. It’s therapeutic. Go on, give it a go! 😉 What an icebreaker, right?! Magic Strawberry Milk- I’m not sure why I got this but it just seemed magical and colorful. The straws hold pink balls of strawberry flavor. As you drink. the milk becomes strawberry flavored. Bing Bong’s Rocket (popsicle)- Riley’s imaginary friend, Bing Bong, has a magic rocket. Theses popsicles made me think of it. To this day, Leeland still calls them Bing Bong’s rocket! Nana trying to read Michael’s Mailbox Club Lesson. Leeland is making that difficult. Ha! Joy in Down Town- You can find emotions all over if you keep your eyes open. Try having an emotion scavenger hunt in your town. I’d love to hear about it in the comments. Feel free to post a link to your blog. So that is the end of our Pixar Camp. We didn’t watch Wall-E or Up because we had already seen them at another time. Here’s a couple of ideas though. Wall-E idea– This made me think of Wall-e. You could use recyclables to make a robot. Michael was so little then! Next Next post: NaNoWriMo 2017!